Analytics will let you add a dimension of "Top Level" category, or will let you add a dimension of the full category, including its complete subcategory. 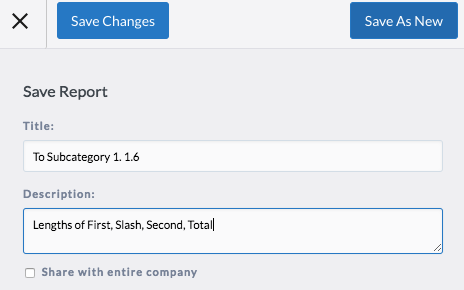 Currently there is not a way to have Analytics report on only the first subcategory, but we can add a calculation to change the full category into just the top-level and secondary subcategory. 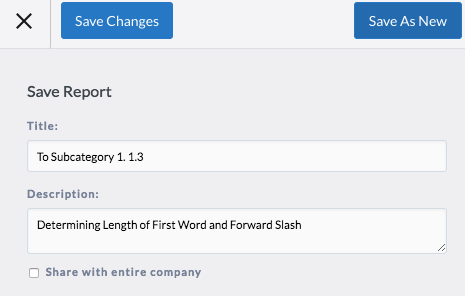 And let's change the dimensions on the report from "Completed Date" to "Category"
Some of these categories are one layer deep, some are two layers deep, some even go further. 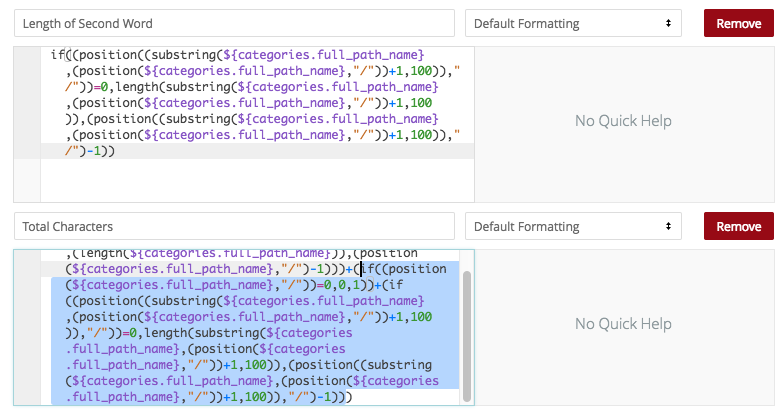 What we want to do, from our cell-based functions, is use the "Substring" function to slice a category at a very precise location, before its second forward slash. The trick now is to determine with calculations if there is a second slash, and if so, where? What is the length of the first category? If there is a forward slash following this, what is its length? 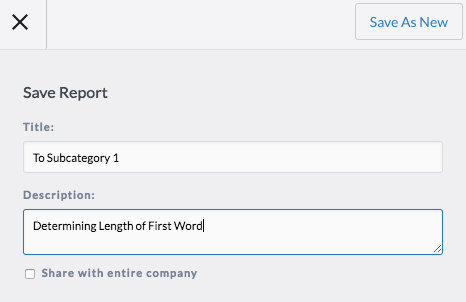 What is the length of the first sub-category? Let's start by using the "Position" function. Position requires two arguments: which column we are looking at, and what content we are looking for. We get a number showing us where the first slash occurs. Some of the categories here no forward slash at all, such as "Labor" in the example above. In these cases, we determine the length of the first word by simply using the "Length" function. 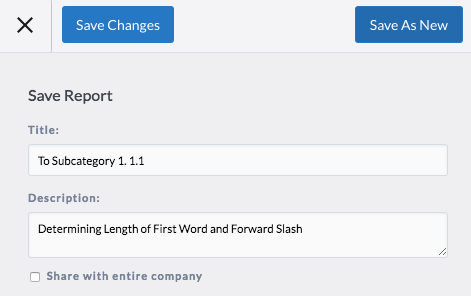 For the categories that do have a forward slash, the calculation above is not showing us how long the word is, but the length of the first word and the forward slash. "Components" for example, is 10 letters long, the forward slash is the 11th character in the string. So we can build an if calculation to determine what to do next. If the first slash is zero, length, if not, the position of the first slash minus 1. What is the length of the forward slash? This, we expect, should not be difficult to determine. Every slash would only be one character long if it is to be found at all. We know that it's in a category if its position is greater than zero. We know it's not in a category if its position is zero. Where it exists, we have a 1, where it doesn't we have a zero. So far, so good. Let's save our work to here. What is the length of the second word? Similarly to finding the length of the first word, we want to find the the place in the category where the second forward slash occurs. To do this, we want to rebuild the content after the first slash. Again, we'll want to use the substring function to return this content, but instead of beginning at position zero, now we are starting at the position of where our first forward slash is. What we want to do is start in the position plus one. ...and then ending with just a really high number for a category length. I'm going to say 100, but this is arbitrary. We have all the content after the first forward slash. Let's save our work as new. 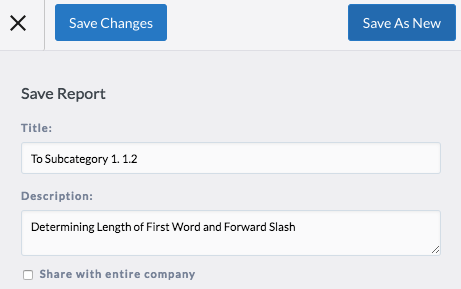 If the position of the second slash is zero, return the length of the remaining content. If the position of the second slash is not zero, return the position of the slash minus one. We get the length of the second word. 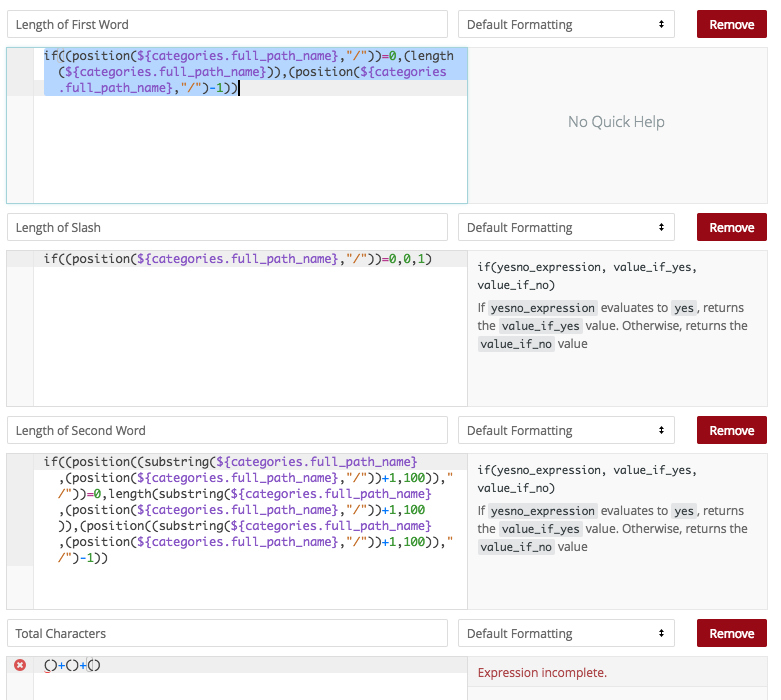 Using Substring, we can look at the remaining content, starting at zero, and looking as far as the length of the second word. So now we have determined the length of the first word, the length of the bracket, and the length of the final word. What is the length of all three? Now a bit of a warning, our report is starting to get heavy with calculations. We should choose how we want to proceed from here. In this discussion, we are just trimming the categories to the first subcategory. so the only numbers we need now are Length of First Word, Length of Slash, and Length of Second Word. Perhaps we would be interested in only retuning the category labels themselves, First Category and Second Category, for further analysis. So the work is done now! 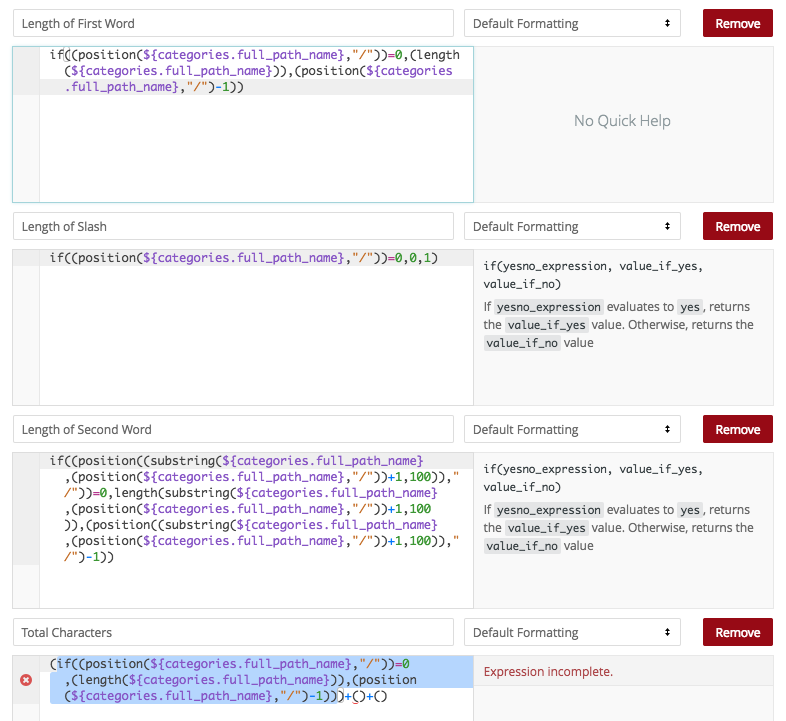 Giving us a final data set that we can run, export, and then easily manipulate for further analysis!